Lotte Mart in HCM City pioneered the recent campaign of using non-plastic bags for food packaging. At its outlet in district 7, vegetables are wrapped in banana leaves instead of plastic bags. Other supermarkets have followed. Big C supermarkets in Hanoi began using banana leaves to wrap some vegetables on April 1. 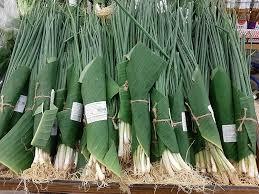 At Big C supermarkets in the central and southern regions, rau don (Diplazium esculentum), a type of wild vegetable, was wrapped in banana leaves. Saigon Co-op, the largest retail chain in Vietnam, is using banana leaves at some of its supermarkets in Phan Thiet, Tay Ninh, Quy Nhon and Tam Ky, before use in its entire network. Besides banana leaves, modern retailers have also tried other environmentally friendly products. A representative of Big C said corn meal-made bags, completely biodegradable, have been used to contain food at its chain since late March. All the plastic bags are biodegradable. The retailer helps customers pack their goods with carton boxes. Bagasse boxes are made of 100 percent of natural fibers which can sustain high temperature in microwaves or low temperature of minus 40oC in refrigerator. It can also contain hot water or oil at over 100oC. Biodegradable bags have been used at the retail chain since 2015. Saigon Co-op has been using biodegradable bags since March 2011. At Lotte Mart, paper straws, eco-green bags, bagasse-made boxes are used, and chicken eggs are wrapped in paper instead of plastic boxes. A representative of Lotte Mart said the chain is going to sell straws made of rice flour, and all ready-cooked food in Hanoi and HCM City will be put into bagasse-made boxes. The materials used to make the boxes are waste from agricultural production. A study found that it is likely to decompose within six weeks when buried under the ground. The appearance of banana leaves at supermarkets is now a hot topic of discussion on women’s forums. Environmental experts say it takes only one second to throw a plastic bag in the environment, but 500-1,000 years for it to decompose. Environmental experts have voiced their concern about the white pollution caused by plastic bags and products, which are very widely used in Vietnam. Plastics cause secondary pollution, seriously affecting soil and water quality. In Hanoi and HCM City alone, 80 tons plastics and plastic bags are discharged every day.